Great customer service is a key driver of increased revenues and profits for any business. It’s more efficient to drive sales out of existing customers than the costs associated with attracting and converting new ones constantly to make up for high attrition rates. Luckily there are some key areas you can focus on to ensure you deliver great customer service, build a legion of loyal customers who will reward the business long term. I’ve pulled together my best tips that will help your business build better engagement with your customers. A positive attitude when dealing with customers enables staff to adopt a can-do mentality meaning they are more likely to go above-and-beyond to help resolve customer enquiries without the sometimes default option to hide behind excuses. Ensure that any promises that are made to the customer are kept. Anytime and every time you break a promise to a customer you lose some trust. Once you lose trust, it’s very difficult to get it back. Loyal customers trust the company they are dealing with. If a customer does not trust you they are susceptible to switching to a competitor at any time. Business is about meeting a consumer’s needs, the better you understand your target consumers the better your product/service offering will be. Whenever you have the opportunity to listen to a customer or ask them questions, take it. This increases customer satisfaction as the customer feels like you are taking a genuine interest in them and it also provides you with information on how to make your offering better suit your target consumers. A lot of businesses limit the level of service they provide to insulate them from being taken advantage of by unscrupulous customers. There will always be a small amount of customers that will take advantage of any situation, luckily they are in the minority. The benefits reaped by businesses that go beyond expectations for all customers compensate for any scrupulous customers many times over. Every time you interact with a customer they have expectations of the level of service they will receive. If you have systems in place to consistently exceed customer expectations, you will create customers for life. Most customer service teams contain a significant amount of people covering a large range of customer enquiries. Not every customer service staff member will know the answer to everything. Ensure systems are in place so that all staff members have readily available people or resources at all times that will solve the majority of enquiries. Creating a strong and well-directed team will boost efficiency in dealing with customer enquiries and increase customer satisfaction. Confidence comes from knowledge, make sure training is a regular and ongoing process for staff so that they stay up-to-date and are prepared for any situation. A lack of training leads to inconsistent customer experiences and increased dissatisfaction. 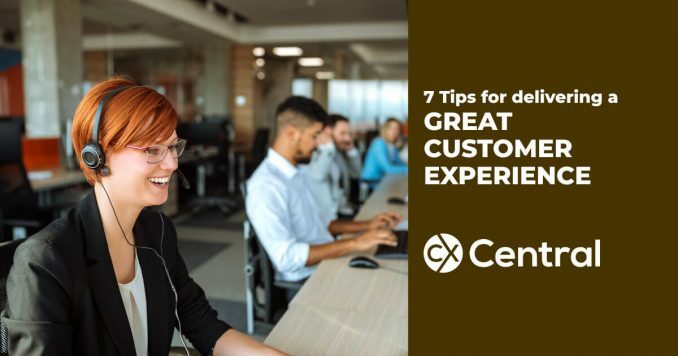 Implement these 7 Tips for delivering a great customer experience for your business and start developing satisfied, loyal and profitable customers for your business.